In an effort to curb California’s housing crisis, the state introduced new laws this year that open the door to more backyard guesthouses and granny flats. Homeowners should find it easier and cheaper — not to mention now legal — to build a second unit (attached or detached) on their property, thanks to two California laws that took effect Jan. 1 this year. The laws ease or eliminate off-street parking requirements and often enormous utility-hookup fees that homeowners face when they create a second dwelling on their property. Local agencies are now blocked from charging connection fees for the granny flats for water and sewer service. Accessory dwelling units (ADUs) could help homeowners meet their mortgage payments, allow multigenerational families to live together (but not too together) and seniors to stay in their homes with an on-site caregiver. 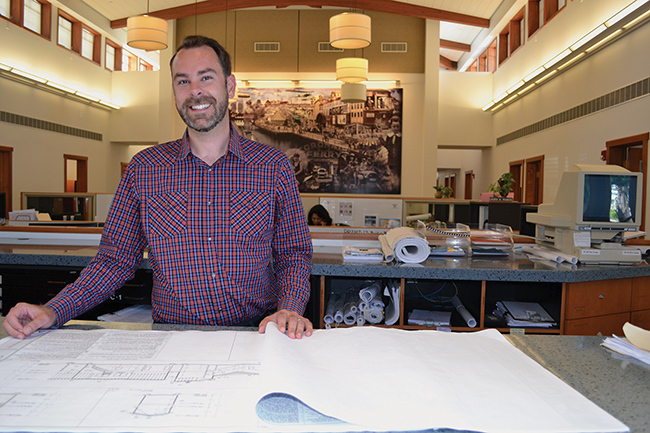 Senior planner Jesse Brown in the city of Coronado’s Department of Community Development is the person to see for questions on accessory dwelling units (ADUs). •Repurposed Existing Space — a space such as a master bedroom, within the primary residence is converted into an independent living unit. Coronado planners might be concerned about even more density and parking concerns in the city, but state law trumps municipal laws. The state enacted the laws, administered by the California Department of Housing and Community Development, because legislators found that the state’s housing production was not keeping up with demand. The lack of housing impacted affordability with average housing costs in the state exceeding the rest of the nation. ADUs allow the state to meet its diverse housing needs: One market is young professionals and students who desire to live in areas close to jobs, amenities and schools; other markets include housing options for family members and friends, in-home health providers, the disabled, and the elderly. Practically speaking, in Coronado, an ADU also allows homeowners lots of flexibility in earning extra income. Homeowners may want to live in their primary house and rent out the ADU, or vice versa. Or they may wish to live in the ADU for just two months of the year, while renting out their larger house to finance a European vacation or pay property taxes. The only stipulation is that the homeowner must occupy either the main house or the ADU — a homeowner may not rent out both at the same time. Is located within one block of a car-share area. In Coronado, the public transit waiver affects a large geographical portion of the community — the vast majority of the city is within a half mile of the Metropolitan Transit bus line (901 and 904 routes). The unit cannot be sold separately from the primary residence but may be rented. No passageway can be required and no setback can be required from an existing garage that is converted to an ADU. Local governments cannot preclude ADUs, but can designate areas where they may not be permitted, due to issues of adequacy of sewer or water, traffic flow or public safety. Coronado’s planning commission voted to not allow ADUs on Third and Fourth streets east of Orange Avenue, nor the 300 blocks of A, B and C due to traffic flow concerns or in alleys or lanes due to lack of public parking. Carriage houses (units above garages along alleys) would also be exempt from conversion into ADUs, due to the fact that their construction covenant states that they may not be rented. The planning commission is also recommending to city council that ADUs, attached or detached, be capped at a maximum of 800 square feet. The ordinance is tentatively scheduled to come before city council in September and would be subject to a public hearing. After vacationing in Coronado each summer for several years, Gary and Kristi Prado decided this is where they wanted to live year-round. So, last year, with Gary eyeing retirement from his work in the construction industry in the San Francisco Bay area, the Prados took the plunge and bought an home in the 600 block of J Avenue and turned to Christian Rice to help them create two dream houses on the lot. The original J Avenue house was built in 1951 and had a five-car garage that fronted the alley. In the ‘70s, the second homeowners redesigned three of those five garages into a guesthouse (without a kitchen). In accordance with California’s new ADU law, Rice renovated both homes, utilizing much of the same footprint, but gutting the interiors. For the main house, he popped out a wall to create a larger master suite, and for the guesthouse, he closed off a passage from the backyard to the garage to allow room for an enlarged bath with a luxury shower. 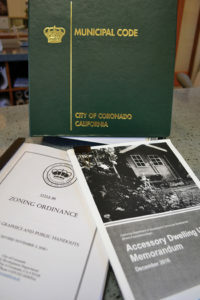 The city of Coronado’s municipal code will soon be updated with a section that spells out the city’s ordinance for accessory dwelling units. Rice did just that in the Prado’s house, and squeezed in a stacker washer and dryer behind a closet. The door to the bedroom features a transom and the main door to the guesthouse is a Dutch door, which lets in even more light. 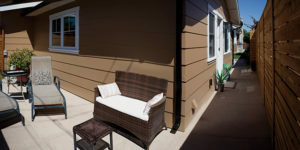 A small patio provides privacy and the separate entrance is also private from the main house. The Prado’s plan to install a gate between the two houses.